So I originally thought this wine was just a new version of the "Director's Cut" label. 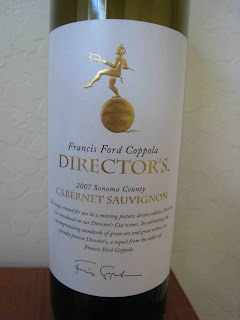 However, the Francis Ford Coppola winery offers three distinct tiers within the Directors family of products. There is this wine (Director's) which is the least expensive and is a Sonoma County appellation wine that is an easy drinking and approachable style. Then there is the (Director's Cut) which showcases several sub-appellations of Sonoma County such as Alexander Valley, Dry Creek Valley, Russian River Valley, and Sonoma Coast. Finally, there is the (Cinema) which is a limited production blend of Alexander Valley and Dry Creek Valley fruit. On the nose I get lots of candied fruit, black raspberry, hints of green pepper, and some cedar and oak notes. There is also secondary aromas of potting soil, tar, and tart cherry. On the palate those candied fruit flavors continue to register with raspberry, black cherry, hints of cedar and spice, and a touch of pepper on the finish. It falls off a bit on the finish and doesn't exhibit a whole lot of depth, but it's more of a fruity style. Great review, I bought this wine at the Coppola winery and loved it! But can't find it anywhere.